The MAX-31k upper receiver is a shortened "k" version of our MAX-31A mk2. This makes the gun more compact and "handy". Due to the short length, it is more practical to use the Suomi M31 50 round coffin magazines rather than the 72 round drum magazines. Sten magazines can also be modified to work and Shockwave Technologies will soon have their ZMAG-S magazines available for sale. The ZMAG-S magazine is a double column, single feed, stick magazine designed for use with guns that accept Suomi M31 magazines. The 36 round double feed magazines are not compatible. Features include a 13-1/2" long accessory rail on top and hard mount points for additional M1913 rails on right and left sides of front handgrip. Bottom rail is integral. Contained within the upper receiver is a heavy weight bolt assembly with a longer length of travel than the stock M-11A1 upper recevier . This reduces the rate of fire (ROF) from 1,800 RPM with .380 ACP ammo down to around 650 or 700 RPM with 9mm ammo. Due to the reduced ROF and longer bolt travel, muzzle rise is reduced, the gun feels much smoother in operation and easily stays on target. The MAX-31k attaches to the stock M-11A1 lower receiver without any modification to the lower receiver and uses your existing retaining pin. The picture above shows a MAX-31k with additional Lage Mfg. accessories that are not included with the MAX-31k upper receiver. Registered lower receiver is not included. 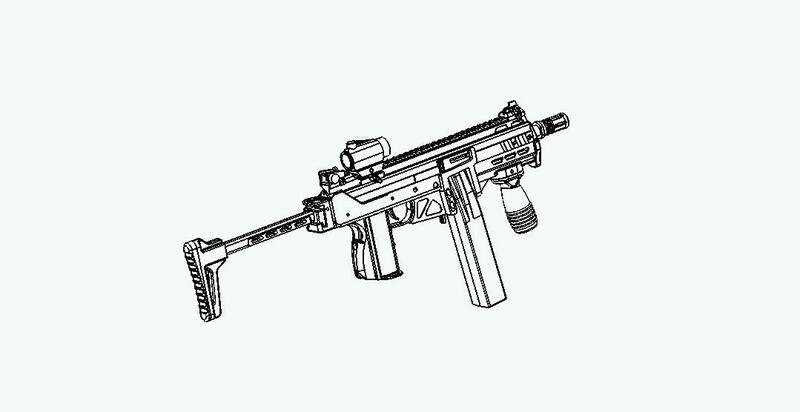 Designed for use with a M-11A1 .380 ACP submachinegun lower receiver. 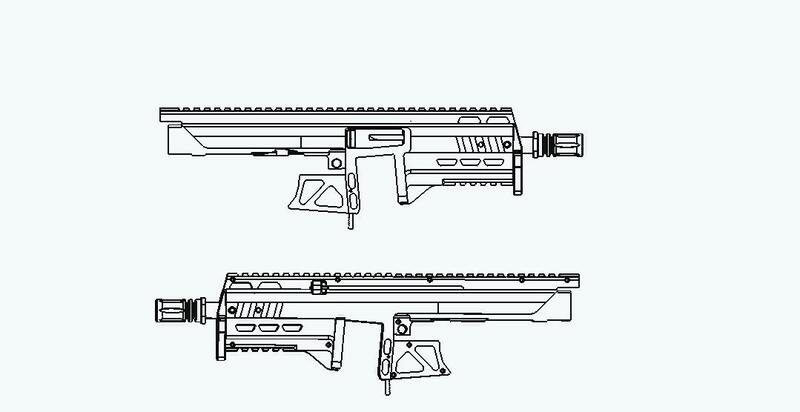 Uses Suomi 50 Round Coffin Magazines, modified Sten Magazines or Shockwave Technologies ZMAG-S magazines. 5-3/4" barrel threaded 1/2-28 at muzzle with "Birdcage" flash suppressor. Other barrel threads available. 13-1/2" long accessory rail along top for mounting a scope or removeable iron sights. Integral 2-3/4" bottom accessory rail. Side cocking, non-reciprocating, spring return charging handle on left side. 650 to 700 RPM rate of fire. Optional rates of fire up to 1041 RPM with use of our Variable Buffer System. No modification of the magazines is required. Overall length with 9-1/2" stock- 27-7/8"
above are approximate. The rate of fire of your ammunition may vary. Steel cased ammo is not recommended. Use of reloaded/re-manufactured ammo will void the warranty.